Ace Of Pentacles: “This is a card of prosperity in the material world. It can indicate a huge commercial success, strong business sense, financial success, rewards and monetary gains. It can also represent physical well-being, good health, a secure income, and contentment. The green tones in the image reflect the energy of earthly wealth. This is the card of material goods, business ability, and fruits of labour realized. The oak pentacle is a symbol of manifestation and the earth elemental, and the ace is a power card showing accomplishment and positive results in matters of finance, business, construction, health, and secure income. this card may also indicate a new job, promotion, or pay raise, which may be clarified by the other cards in the spread. 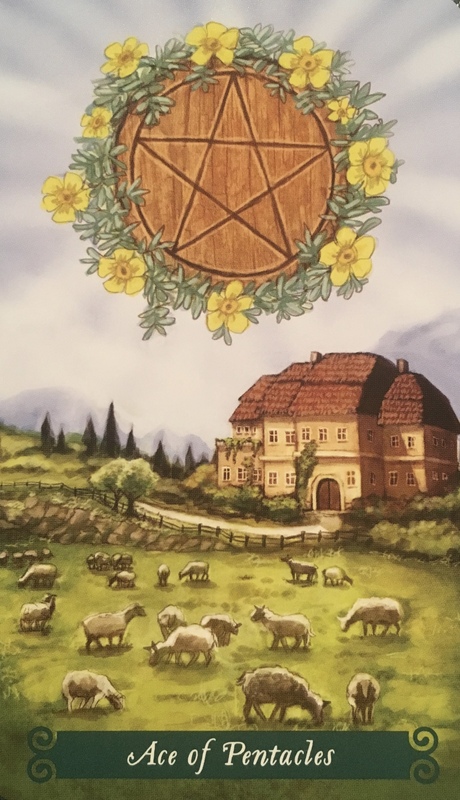 An auspicious card of good fortune and bliss, the Ace of Pentacles shows worthwhile efforts and productivity that pay off, as well as spiritual well-being. What many of us need at this point in the aftermath of many natural disasters and general chaos is hope. Hope is what lets us carry on, rebuilding and recreating. Hope is what comes when our faith is rewarded with a glimmer of what is possible after the pain. It is a second chance, a solution or a helping hand reaching out to support us through our struggle. Hope is here in the form of material reality. It is here in a tangible way. Sometimes we have to rely on faith alone; we have to know with absolute conviction that our prayers are being answered and our dreams really are about to come true. This is the next step. A gift offered. An opportunity. A windfall. Something that you can see; something or someone that you can reach out and touch. Something that makes all the difference. Allows you to breathe again. Allows you to take the steps you need to take in order to carry on. This message is not here to challenge you it is here to lend a hand. Look for the silver lining… maybe even gold. Look for signs and messages. Keep the flame of hope burning brightly in your hearts.